Have a hunter or a recreational shooter on your shopping list this holiday season? Then give these gift ideas some serious consideration for wrapping up and putting under the Christmas tree! Don’t look now, but it’s time for the annual Thanksgiving Day celebration — when family and friends come together to enjoy quality time, watch football, enjoy the roasted turkey and polish off the last piece of pumpkin pie. But after the classic American holiday runs its course, it’ll be time to start the 2018 Christmas shopping season with dozens of Black Friday bargains at Academy Sports + Outdoors, followed by a myriad of Academy.com online specials on Cyber Monday. For the deer hunter on your list that likes the thought of going afield with a fast crossbow in his or her hands, look no further than the PSE Fang LT Compound Crossbow model. 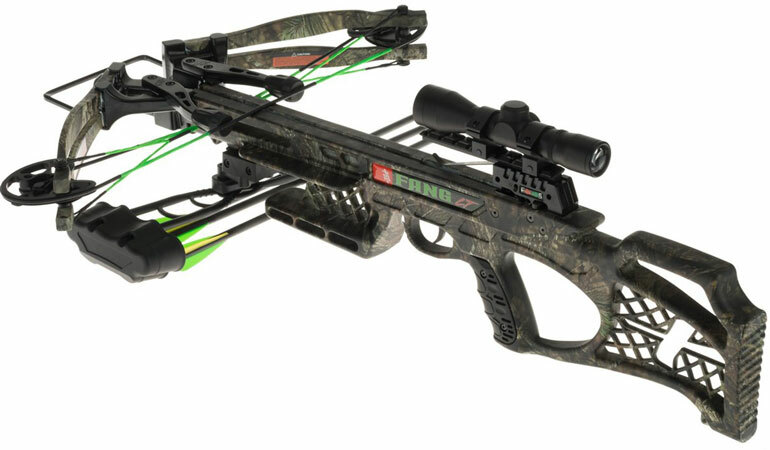 Able to shoot crossbow bolts at 320-330 FPS, the ambidextrous Fang LT package measures 32 inches in length, weighs only 5.8 pounds and has a draw weight of 165 pounds.Concealed with Mossy Oak Break-Up Country camo, the crossbow package also features an auto-safety and anti-dry-fire trigger system, a lightweight and compact stock, string stops, a 4x32 multi-reticle scope, three 20-inch carbon bolts with nocks, three 100-grain field points, a five-bolt quick-detach quiver, a swivel sling and a stick of rail lube. With a limited lifetime warranty, the Fang LT model is tough, lightweight and very accurate — a crossbow that will have the deer hunter on your list putting tight groups into a downrange 3-D or bag target as soon as Christmas Day afternoon. 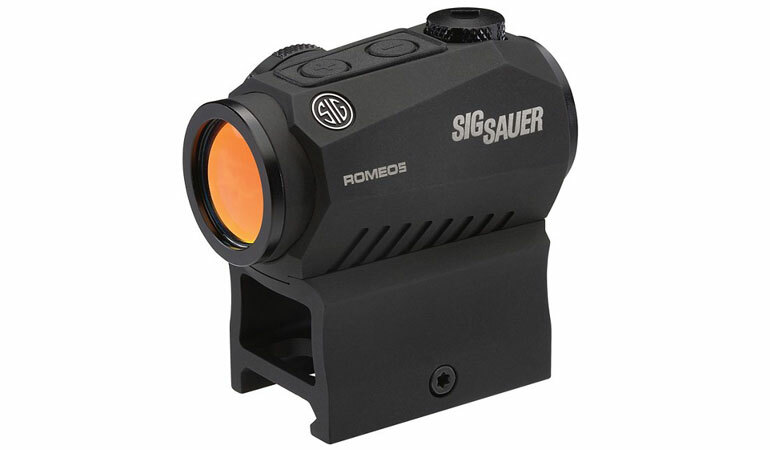 If you’ve got a shooter in your household, the idea of Santa leaving a SIG SAUER Romeo 5 1x20 Compact Red Dot Sight under the tree is sure to bring a smile. Whether it’s for plinking on the range with a modern sporting rifle, chasing turkeys in the springtime woods or doing a bit of predator control in the offseason, the Romeo5’s Spectracoat lens coatings will reduce surface reflections and bring excellent light transmission. What’s more, the Romeo5 is packaged in a strong, lightweight aluminum housing that has IPX-7 water- and fog-proof features. With a 2 MOA red-dot reticle that gives eight daylight and two nighttime settings, quick downrange target acquisition is a breeze. Turned on by a Motion Activated Illumination system, the sight is ready when needed and powers down when it’s not in use so that the battery life is prolonged. Incidentally, the unit runs on a CR2032 lithium battery (not included) that can be changed from the side without having to remove the sight. With a limited lifetime warranty on some features — and a five-year manufacturer’s warranty on other electric features — this sight will help provide hours of accurate shooting fun out in the woods or at the local gun range. 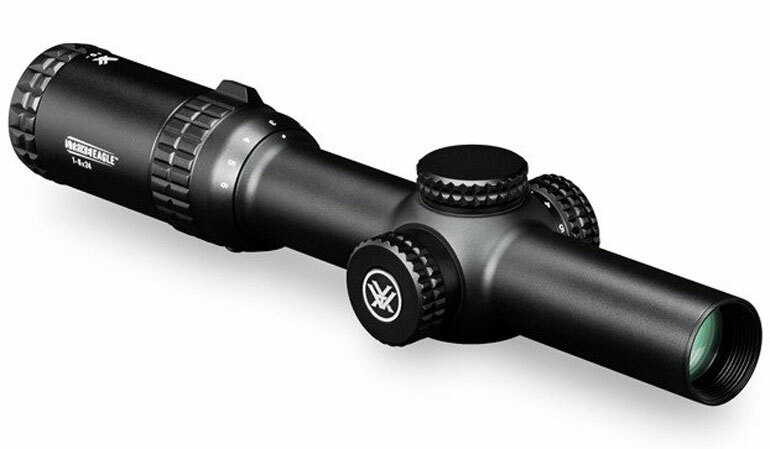 Staying with gift ideas for shooting fun, a Vortex Strike Eagle 1-6 x 24 Rifle Scope is sure to bring a big smile over the holidays. Whether your hunter is using a handgun or modern sporting rifle to deer hunt with or a shotgun for close-range shooting, the Strike Eagle’s multicoated optics deliver maximum light transmission and superb brightness in a scope that weighs 17.6 ounces, offers 3.5 inches of eye-relief and has a matte finish. And since this scope is made of solid block aircraft-grade aluminum, it comes in a strong scope body package that is also water- and fog-proof. Add in a fast-focus eyepiece and an illuminated glass-etched AR-BDC reticle and the Strike Eagle can help a shooter with quick target acquisition on the shooting range, out in the field for feral hogs or maybe during an afternoon hunt spent targeting varmints. Whether it’s for self-defense, concealed carry or snake and varmint control out on the hunting lease, if you have a new handgun waiting for you this holiday season, be sure and keep it safe, secure and readily accessible at a moment’s notice. 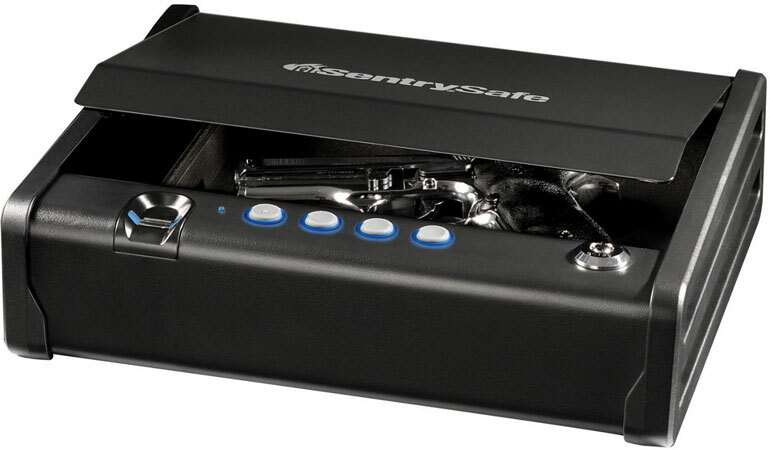 That’s what the Sentry Safe Quick-Access Biometric Pistol Safe will do thanks in part to its pry-resistant and solid construction with 12-gauge steel. And with the biometric fingerprint lock feature — which comes with a backlit electronic keypad for up to two users — your firearm will be safe from theft and unauthorized use. With a silent opening capability thanks to a compression gas strut, this single handgun unit requires four “AA” batteries for keypad and biometric entry, along with a tubular override key for gaining quick backup access. It’s no secret that Santa delivers a lot of new big game and deer hunting rifles each Christmas. But the joy of getting a new rifle and scope to take your next big buck or bull with can quickly be tempered by the uncomfortable chore of sighting it all in. 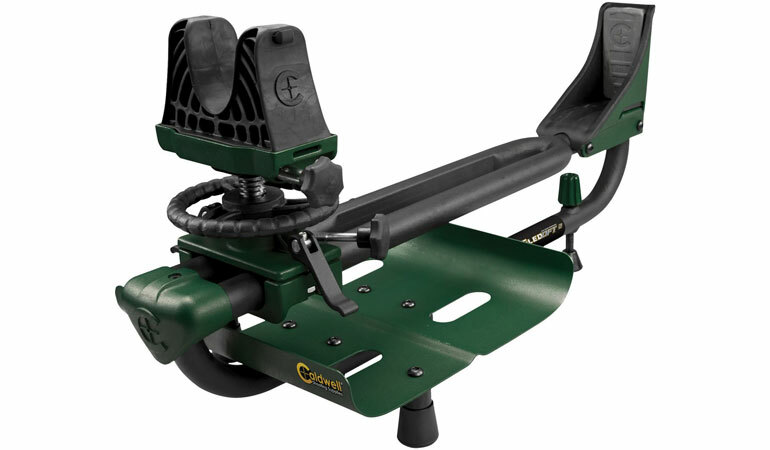 That’s where the Caldwell Lead Sled DFW 2 Shooting Rest comes in. It is an indispensable item on the gun range for anyone who likes to shoot but doesn’t care for excessive recoil. Able to be adjusted up to 18 inches to fit most rifles — and spring turkey hunting shotguns, too — this dual-frame design weighs 24 pounds and helps tame recoil on even the biggest calibers or when sighting in a shotgun with magnum turkey loads. And if you’ve got a late-season muzzleloader hunt for deer, this Caldwell Lead Sled will even help with sighting in, too. With the front cradle sliding back and forth along the dual frame for easy adjustment, using the Lead Sled is a breeze. And with the rest’s ability to support up to 100 pounds of lead shot to help dampen recoil, the DFW 2 Shooting Rest can help lead to an afternoon of fun, enjoyable and precision shooting. Whether you’ve got a late-season deer hunt planned, a post-holiday visit to the duck blind, a pointer ready to lock down on some January quail or you simply want to look stylish out and about on the town, the Magellan Outdoors Men’s Boone Jacket has got you covered. 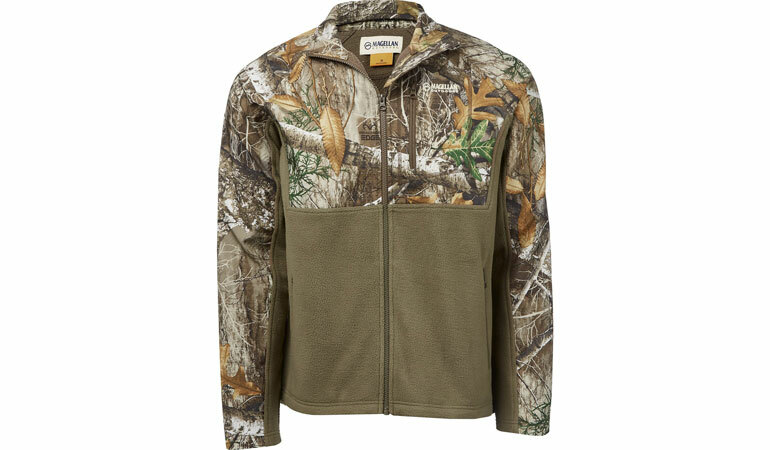 Constructed of 100% polyester fleece, the Boone Jacket features integrated flex technology to help a hunter move their arms for a shot without restricting their range of motion. And being hip length and not too heavy, the Boone Jacket is perfect for a hunter walking to their deer stand, climbing into a morning duck blind after a lengthy trek or walking up to a brace of bird dogs with a snootful of bobwhite quail scent! With cold, wet weather a usual bet around the holidays, a trek into the deer woods, a visit to the duck blind or even running out back to feed the bird dogs can all be a damp, muddy, and chilly chore. 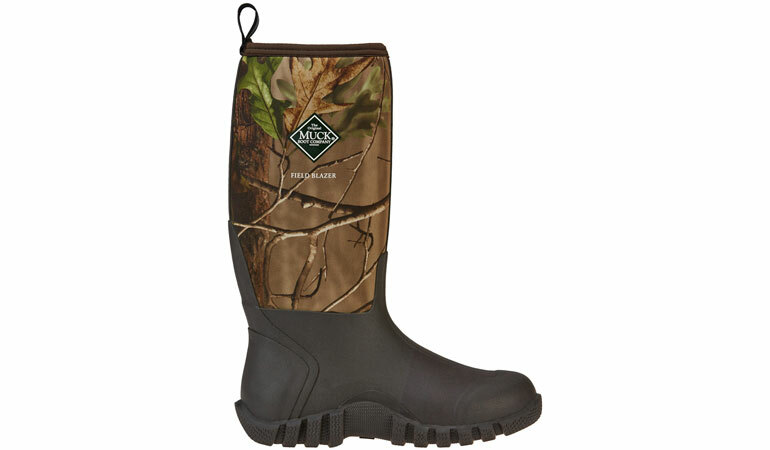 That’s where the warm, dry and comfortable Muck Boots Adults’ Field Blazer Insulated Hunting Boots come into play thanks to warm fleece insulation and 5mm neoprene uppers that help your keep feet dry and cozy in temperatures all the way down to -20°F (temperature rating). Add in shank reinforcements for Achilles support, wraparound outsoles with large horizontal grip strips to aid traction in slippery conditions and Realtree APG camouflage, and this is a can’t-miss gift for the hunter that is hoping to find some goodies under the tree. 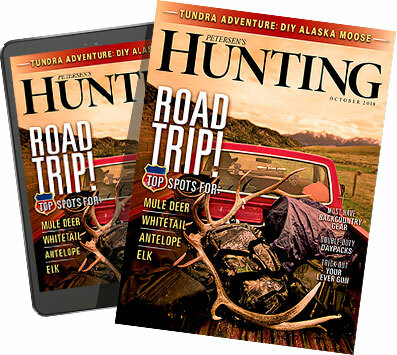 If you’ve got a hunting or shooting enthusiast on your gift list this Christmas shopping season, then these gift ideas are a good start for Santa and his helpers to consider prior to the 25th of December. And if you need even more gift ideas, a visit to Academy.com or with knowledgeable sales associates at a local Academy Sports + Outdoors store is sure to help you get your shopping done early — all while bringing a large supply of big, beaming holiday smiles around the glowing Christmas tree! Prices are subject to change. Please refer to www.academy.com for the latest prices.